The Intermediaries Legislation, or IR35 as it is more commonly known, is the single most important tax law affecting you as a freelance contractor. The aim of IR35 is to prevent an individual, who would ordinarily be viewed as an employee, offering his or her services through a limited company to avoid paying Income Tax and National Insurance Contributions. If you as an individual enter directly into a contract with an employer, you will receive a salary that would be subject to Income Tax of up to 45% and National Insurance Contributions of up to 12%. Where a Limited Company enters into the same contract then the tax rules are different. A limited company will not be viewed as receiving a salary. It will make a profit on which it will pay business tax of only 19% and most importantly it will not be subject to National Insurance Contributions at all. To prevent every employee from setting up their own Limited Company in order to avoid National Insurance and the potentially higher levels of tax this is where IR35 steps in. Unfortunately, to make matters worse employment law does not provide a distinction between employment and self-employment, leaving you to rely upon past judgments in common law to reach your decision. In determining the status of an individual as employed you would need to establish that all three prerequisites of employment status are present. You are required to provide the service personally. You are subject to Supervision, Direction or Control over the manner in which the work is performed. There is a mutual obligation of both parties; your employer is obliged to provide work and you are obliged to make yourself available to do so. If you’re working on a Public Sector assignment, the responsibility lies with your end client. However, if you have a contract in the Private Sector, this comes down to you as the director of your limited company. As a consequence we would recommend that you seek professional assistance before making your final decision. So in order to be deemed as ‘outside’ IR35, will I need to show I am in business on my own account (effectively self-employed)? For IR35 to apply you need to be regarded as an employee of the end client. So conversely to remain ‘outside’ of IR35 legislation you need to show that you are not an employee of the end client. This is not the same as showing you are self-employed, although being able to demonstrate you are in business on your own account is always regarded as the best option. You need to differentiate yourself from the actual employees of your end client, beginning with the contract you sign and how you act on a day to day basis. Do not sign a contract until you have taken professional advice and are satisfied with the IR35 terms and conditions. Keep records of particular events which demonstrated that you acted differently from an end client employee e.g. during an IT failure you went home and received no pay, when all employees remained. Choose a business name (don’t use your own), create your own logo and business stationery, and sell your services via your company website. Take advice to ensure that you are aware of any special rules that may apply in your sector which mean IR35 automatically applies. An individual performs services for a client. These services are provided under a contract involving a limited company. If the services were provided under a contract directly between the individual and the client, the individual would be regarded as an employee of the client. One exception to these conditions is in relation to being an ‘Office Holder’. By simply being an office holder of your end client IR35 will apply; there is no need to consider condition 3. General administration expenses (Private Sector only) An allowance equal to 5% of the total IR35 income is deducted rather than the actual cost incurred. This allows for the general expense of running a business, such as accountancy fees and marketing costs. Other expenses – including travel & subsistence These are expenses which you could have claimed as a deduction if you had been directly employed by the client. For example, travel costs between workplaces, professional subscriptions and Professional Indemnity Insurance are all allowable deductions. Note: operating under IR35 will mean that your workplace is no longer considered temporary and as such, home to work travel is not allowable as a deduction. Capital allowances You’re only allowed to make a deduction for capital allowances where the plant or machinery bought is necessary for the performance of the contract within IR35. Examples include the cost of a computer or laptop. 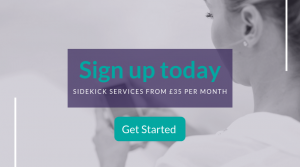 For more information or advice on IR35 contact support@yoursidekick.co.uk or call 0808 164 3000.